A recent editorial sparked controversy about the apparent failure of deinstitutionalization and community mental health to adequately address the needs of those with severe mental illness. But should that mean a return to institutional care? Many definitions of "asylum" include words such as "shelter," "refuge," and "protection" that evoke bucolic images filled with peace and serenity. Pair the word "asylum" with the word "psychiatric," however, and it's likely that much different images are evoked. Images of horror, imprisonment, abuse, desolation—images so strong they may even evoke a physical feeling of revulsion. Dominic Sisti, PhD, wants you to rethink those visceral reactions. In an article published in early 2015 in the Journal of the American Medical Association (JAMA), Sisti and fellow ethicists Ezekiel Emmanuel, MD, PhD, and Andrea Segal, MS, call for the return of psychiatric asylums. Their argument: The deinstitutionalization wave of the past half-century has been such a failure for some people with serious mental illness that the only way they can receive ethical and humane care is in the structured setting of an asylum. "The basic claim is that people with severe mental illness deserve appropriate care at the appropriate time in the appropriate setting," says Sisti, director of the Scattergood Program for the Applied Ethics of Behavioral Health Care at the University of Pennsylvania Perelman School of Medicine. "The idea is that individuals with severe mental illness are at risk of becoming victims of violence and abuse, and they deserve a safe place to live and hopefully recover where they're treated with dignity." To understand the debate over psychiatric asylums, one must step back and consider the history of institutionalization and deinstitutionalization and the social, economic, political, and legal forces that have shaped that history. In the mid-1800s, shocked by the abuses that people with mental illness faced in jails and almshouses, reformers such as Dorothea Dix called for the establishment of asylums. The asylums, as the reformers envisioned them, would provide places of respite for small groups of patients where they could receive individualized care, learn trades, and pursue artistic activities in a pastoral setting (Morrissey & Goldman, 1986). Many states began to adopt the new model, but there soon were signs that the model was unsustainable (Morrissey & Goldman). As the country's population began to swell because of immigration, the asylums began to fill up, and states realized that they could save money if they put more patients in larger facilities. The small, homey feeling of the original asylums soon gave way to large, sprawling institutions that housed hundreds or thousands of patients. The rise of psychiatry in the early 20th century accelerated the transformation of asylums into large treatment facilities. Continued overcrowding and budget constraints turned many of these once-idyllic facilities into dilapidated, nightmarish places run by staff overwhelmed by the demand for services. A Life magazine article aptly named "Bedlam 1946" (Maisel, 1946) exposed readers to the miserable lives of many patients in psychiatric institutions—isolated, underfed, restrained, and often subject to abuse from hospital staff. The accompanying photographs shocked many Americans. Doctors desperate to help patients turned to some of the more infamous treatments for mental illness, including insulin shock therapy, electroshock therapy, and lobotomies. Although public sentiment was already beginning to turn against institutions, the deinstitutionalization movement really began to accelerate in the mid-1950s when the FDA approved Thorazine as the first psychiatric medication. Psychiatrists began to see the day coming when people with serious mental illness could be treated in the community with medication rather than spending their lives in institutions. While the first step in deinstitutionalization was scientific, the next steps were political and legal. In 1963, President John F. Kennedy signed the Community Mental Health Act, which established a national network of community mental health centers. At the same time, there was increased attention to the civil rights of people with mental illness and court decisions made it more difficult for people to be involuntarily institutionalized (Morrissey & Goldman). Patient populations at public psychiatric institutions began to decline in the 1950s, and this decline accelerated significantly in the late 1960s and 1970s. More than 500,000 people were in public psychiatric facilities in 1955; today, that number is 45,000 (Sisti, Segal, & Emanuel, 2015). Deinstitutionalization has been beneficial for many—if not most—of the people who were formerly institutionalized or who would have been institutionalized during previous eras. With the assistance of community-based services, these people have been able to live independently or in group homes, find jobs, and gain self-efficacy. Yet, the intensive needs of some people with serious mental illness have been too much for community-based services that are underresourced and overwhelmed by demand. For these patients, community-based care has been little more than transinstitutionalization; people who would have been in psychiatric asylums have simply been transferred to other institutions such as homeless shelters, nursing homes, and jails where they cannot access adequate treatment. Others cycle in and out of emergency departments. The transfer of people with mental illness into the criminal justice system has been especially troubling. Reports indicate that mental illness affects 56% of state prisoners, 45% of federal prisoners, and 64% of jail inmates (Kim, Becker-Cohen, & Serakos, 2015). For Sisti, the current state of the mental health care system in the United States is reminiscent of the conditions that shocked reformers in the mid-1800s. The most ethical solution, he believes, is to reestablish asylums in the way that they were originally intended, as places of safety and sanctuary. "I wouldn't say deinstitutionalization was a failure," Sisti says. "But it went too far. With success, people got too overzealous and the pendulum swung too far in the other direction." The arguments presented by Sisti and his colleagues have some proponents in the psychiatric community. For example, Rhode Island psychiatrist Christine Montross wrote a piece for The New York Times (2015) in which she expressed support for the return of asylums. Yet, Sisti acknowledges that the JAMA article initially engendered a lot of opposition. Some of this opposition has abated, he says, as people become more aware that what he and his coauthors are calling for are humane facilities, not the draconian institutions of the mid-20th century. Nor are they calling for the dismantling of the community mental health system. "[People] get it now and mostly agree with the basic argument. Things are more positive now," Sisti says. "A lot of the knee-jerk negative reaction was to the word 'asylum.'" But it seems unlikely that new asylums will begin popping up anytime soon. 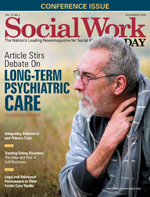 Several of the mental health professionals contacted by Social Work Today agree with Sisti that deinstitutionalization has had its challenges and has sometimes failed to meet the idealistic expectations of proponents of community-based care. However, the idea of opening more asylums elicited responses that ranged from discomfort to opposition. No matter how well-intentioned Sisti and his colleagues are in proposing humane asylums where people with mental illness could find safety and security, economic and political pressures would soon start to push these modern facilities back toward their sordid past as warehouses for unwanted humanity, says Phyllis Solomon, PhD, a professor at the University of Pennsylvania School of Social Policy & Practice. Just because the community mental health system hasn't figured out a way to best treat the people with the most severe mental illness, that doesn't mean they should be isolated in institutions, she says. "I don't think there are easy answers, but I certainly don't think we should go back to institutions," Solomon says. "We should figure out a way to do it in the community." Asylums perpetuate an outdated notion that people with serious mental illness need to go somewhere to access services rather than services coming to them, says Leah Harris, director of communications at the Judge David L. Bazelon Center for Mental Health Law in Washington, DC. There are outpatient services such as mobile crisis response and peer support that can be effective in engaging people where they are instead of taking them out of the community, Harris says, and there needs to be a greater focus on integrating physical and mental health services. "We need integrated one-stop shopping where they can get all of the services they need," she says. "We're putting too much of the burden on someone struggling to manage day-to-day. We want people to magically navigate our fragmented system." Policy makers and advocates might not have completely comprehended just how many supports people would need once they left psychiatric institutions, says Maggie Pruett-Saratan, MA, MHP, LPC, CCDPD, of Empower Youth, a mental health consulting firm in Pennsylvania. She believes resources should be focused on making these services—such as housing, transportation, primary health care services, and psychiatric care—more accessible, and long-term inpatient care should be only a part of an overall continuum of care and not a default option. Pruett-Saratan says that although it's unacceptable to bring back psychiatric institutions as they were in the mid-20th century, the JAMA article has generally been a positive thing because it at least gets people talking about how to best improve care for people with serious mental illness. "It got people talking about an issue that we can't just sit back and be complacent about," she says. "It's a good conversation that needs to be reopened." Sisti believes mental health professionals have no choice but to reopen the conversation about deinstitutionalization, particularly as the criminal justice system becomes increasingly stressed by the needs of prisoners with mental illness. This conversation could even become a factor in the 2016 presidential election, he says. But social workers don't need to wait for politicians and policy makers to help improve care for people with serious mental illness. There are many simple things they can do in their own communities to move reform forward and reduce the stigma of mental illness, says Sherry Saturno, LCSW, DCSW, executive director of the Hudson Valley Care Coalition in New York. For example, NASW is a founding member in the Campaign to Change Direction, a national movement to promote dialogue with the public about mental health, mental illness, and mental well-being. "There are many opportunities for mental health workers to connect with agencies and organizations in their local communities to lend their voices to the ongoing dialogue about mental health care," Saturno says. "Mental health workers can lead by example through the demonstration of their compassion, ethics, and humanity in working with people with mental illness." Solomon says more social workers need to open themselves up to working with clients with serious mental illness. Sometimes these clients are seen as the "impossible" cases and work with them is seen as beneath the level of highly educated social workers. Social workers' talents, advocacy skills, and focus on the whole person could go a long way in helping these clients thrive in the community and avoid institutionalization, Solomon says. "I do believe that the better approach is to work with people. I believe that if you work with people to validate their views and positions, it becomes a partnership," she says. "It takes real time and effort. If you do it, though, you have far more success and you don't need a hospital." Although psychiatric asylums have largely disappeared from the American landscape, the buildings that once housed them often remain intact, silent reminders of the era of institutionalization. One such asylum is Harrisburg State Hospital in Harrisburg, PA. Established in 1845 as the Pennsylvania State Lunatic Hospital, it was the first public institution in Pennsylvania and one of the first public facilities in the nation. Dubbed the "City on the Hill," Harrisburg State Hospital grew over the years into a complex of more than 1,000 acres with more than 70 buildings, including administrative buildings, patient residences, support facilities, an infirmary, libraries, and a chapel. Many of these buildings were designed by noted Pennsylvania architects and illustrated the shift from the Kirkbride model of housing patients in large buildings to the cottage model that emphasized smaller residences and more open space. The hospital also featured its own farm that provided patients with food and an opportunity for productive labor. Like many of its counterparts in other states, Harrisburg State Hospital was designed to offer patients peace and quiet in an idyllic setting. That sense of serenity was apparent on a recent sunny Sunday afternoon. Stately brick buildings stood on well-manicured lands surrounded by trees. Quaint gazebos dotted the landscape, as did bushes blooming with pink and purple flowers. The sound of birds chirping and the breeze rustling through the trees drowned out the noise from a nearby interstate. The scene was more reminiscent of a college campus than a hospital. Harrisburg State Hospital at one time had more than 2,000 patients, but its population started to dwindle after World War II as the deinstitutionalization movement took hold. The facility gained some notoriety in the late 1990s when it was featured in the 1999 film Girl, Interrupted, starring Winona Ryder and Angelina Jolie based on the 1993 novel of the same name, but that did not stop its decline. The hospital closed in 2006. While some of the buildings are now used as office space by various Pennsylvania state agencies, others stand eerily empty waiting for the next chapters in their lives. The state Department of General Services is now working on a plan to sell and redevelop much of the property. To learn more about Harrisburg State Hospital, visit hsh.thomas-industriesinc.com. For more information about other public asylums in the United States and other countries, visit www.asylumprojects.org. Kim, K., Becker-Cohen, M., & Serakos, M. (2015). The processing and treatment of mentally ill persons in the criminal justice system: A scan of practice and background analysis. Washington, D.C.: Urban Institute. Maisel, A.Q. (1946). Bedlam 1946: Most U.S. mental hospitals are a shame and a disgrace. Life, 20(18), 102-118. Montross, C. (2015). The modern asylum. The New York Times. Retrieved from http://www.nytimes.com/2015/02/18/opinion/the-modern-asylum.html?_r=1. Morrissey, J.P., & Goldman, H.H. (1986). Care and treatment of the mentally ill in the United States: Historical developments and reforms. Annals of the American Academy of Political and Social Science, 484(1), 12-27. Sisti, D.A., Segal, A.G., & Emanuel, E.J. (2015). Improving long-term psychiatric care: Bring back the asylum. Journal of the American Medical Association, 313(3), 243-244.